A quick and easy dessert, with ingredients you already have on hand! That is how every recipe should start, right? Wouldn’t that be nice! 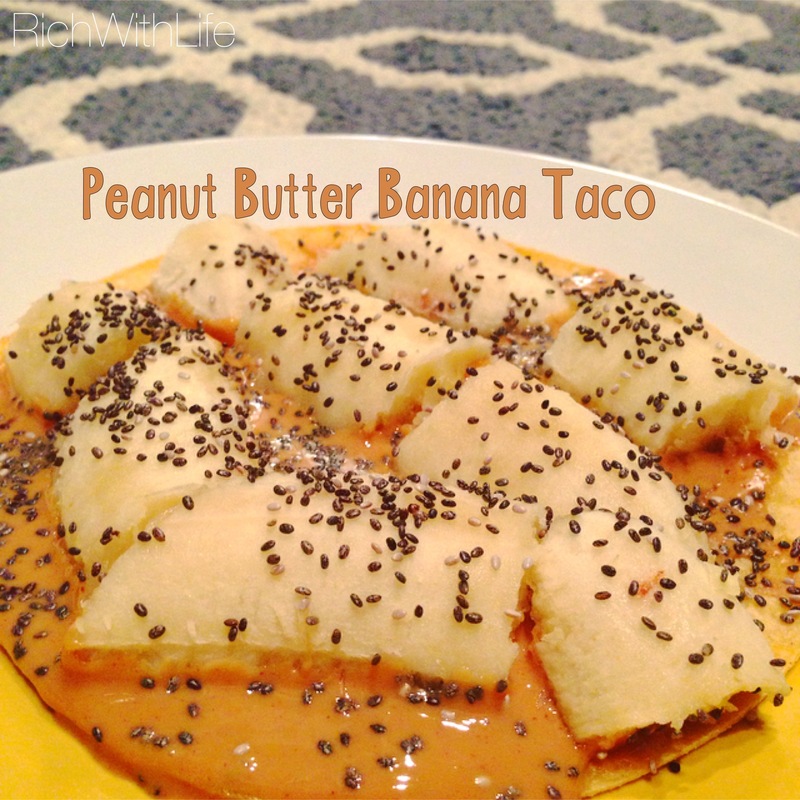 This is a great dessert (or snack) that I used to make often in college. It was one of those where I made it, fell in love with it, made it way too many times in a row for months, and then never craved it anymore. Lucky for me (and for you!) my cravings are back in full swing and I am loving this dessert right now. I think I have eaten it 5 out of the last 6 or 7 days. It’s the perfect combination of warm gooey-goodness, with a soft crunch (is that even a thing?) and the corn makes it even a little salty. Plus, there is banana, and who doesn’t love banana?! If you’ve spent any time on my blog, you can see that I’m a little obsessed. On that note actually, I just recently made a new friend. Oh yeah, by the way, I moved to Texas. It’s been a while since I posted and I had this whole plan to blog every week, etc, etc, and then life happened. Anyway, I am in grad school and it’s insanely busy, but I promised myself I would write this recipe post this week. So, back to what i was saying — New friend! Ah! She is the coolest! She can’t eat many of the same foods as me! Sadly though, one intolerance she has that we do not share is bananas. … I know! So tough. 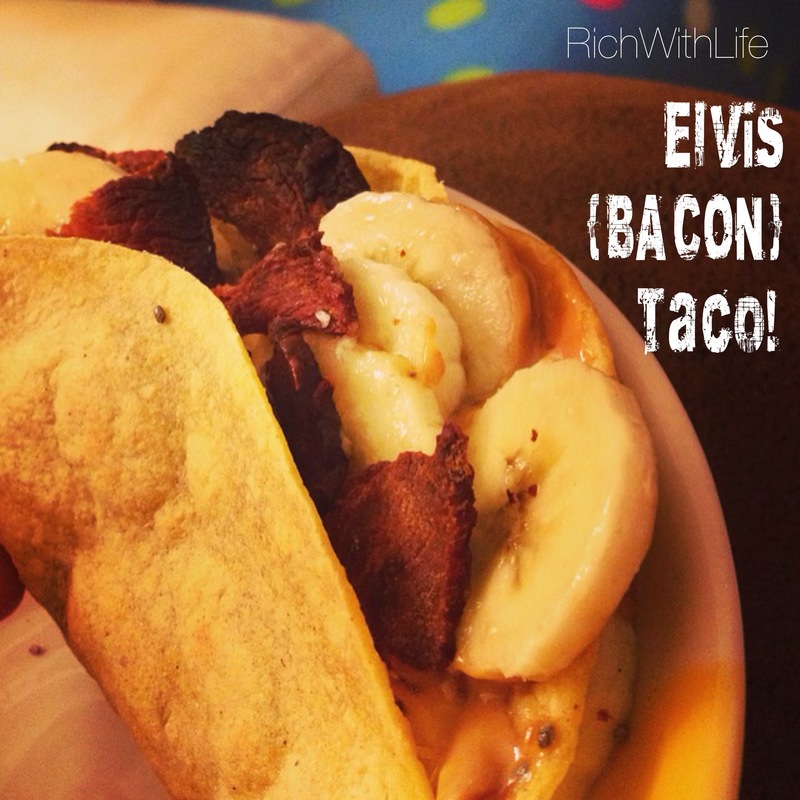 So I am going to be trying to brainstorm some new ideas for how to make these recipes and new ones without bananas. But I definitely think you could put other things in this like pineapple, apples (cooked or raw! ), pears, strawberries — go crazy, get creative!! Here’s where it gets really fun: optional add-ins! Warm a skillet on medium heat. Lay the tortilla face up in the pan and heat about a minute or so, just until the peanut butter starts looking melty and the tortilla has really warmed. Cut the banana however you like. You can do lots of thin circles, down the middle lengthways and then once or twice again to shorten them up, or any combination. You just don’t want thick fat pieces. I use a whole banana and eat mine really messy, but if you use half it will roll up much more nicely and not be as filling. 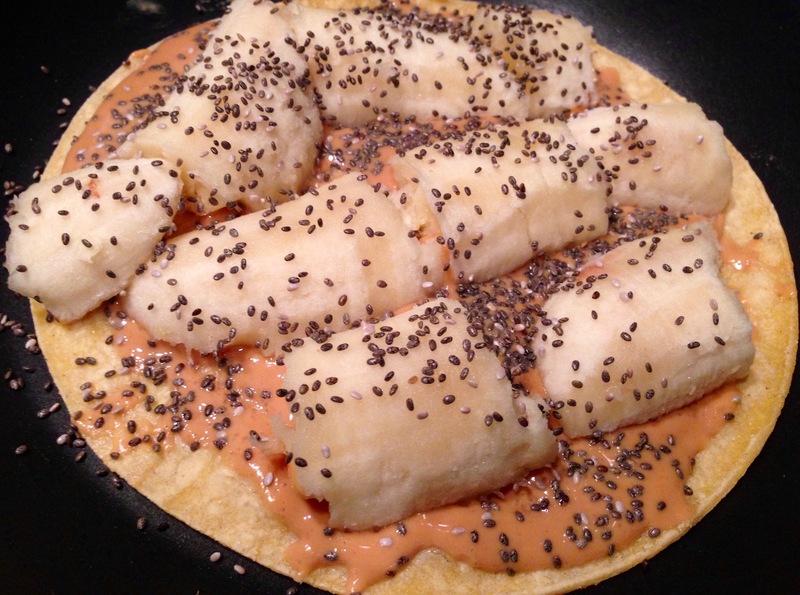 Lay the banana in the peanut butter/tortilla on the skillet and warm just another 30-60 seconds. 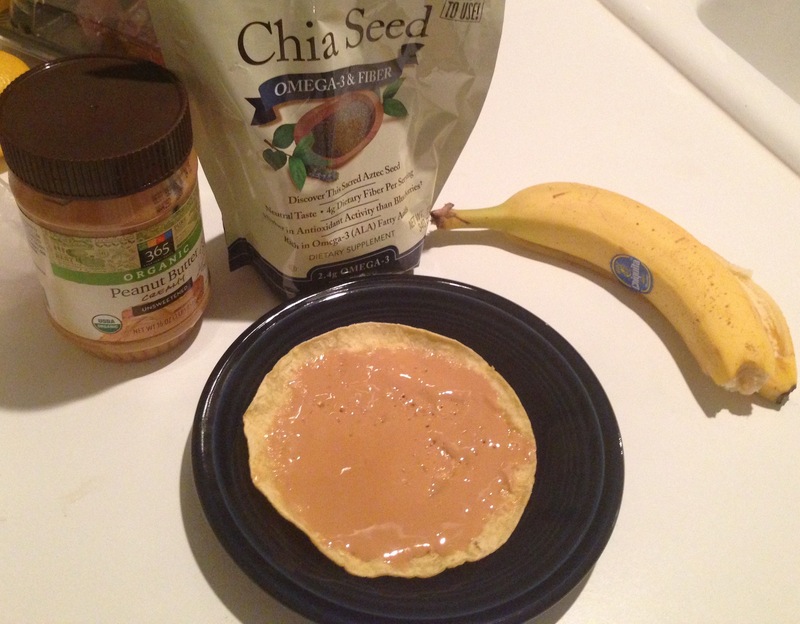 Sprinkle with some chia seeds and any other toppings you want to add! Fold it over quickly while the tortilla is still hot. If you have a good (usually local) tortilla it will fold over and crisp up nicely. Sometimes the big brands that are easy to find in the store don’t always stay folded over as well. It depends on the tortilla’s thickness too. Dig in! The melty peanut butter will gush out the sides leaving you no choice but to lick your fingers! Ooooh I am just craving this so much now! Enjoy!! I am going to have to try some of these additional adaptations and post updated photos when I do! Please, if you try some new concoction (or one listed above) let me know in the comments!! 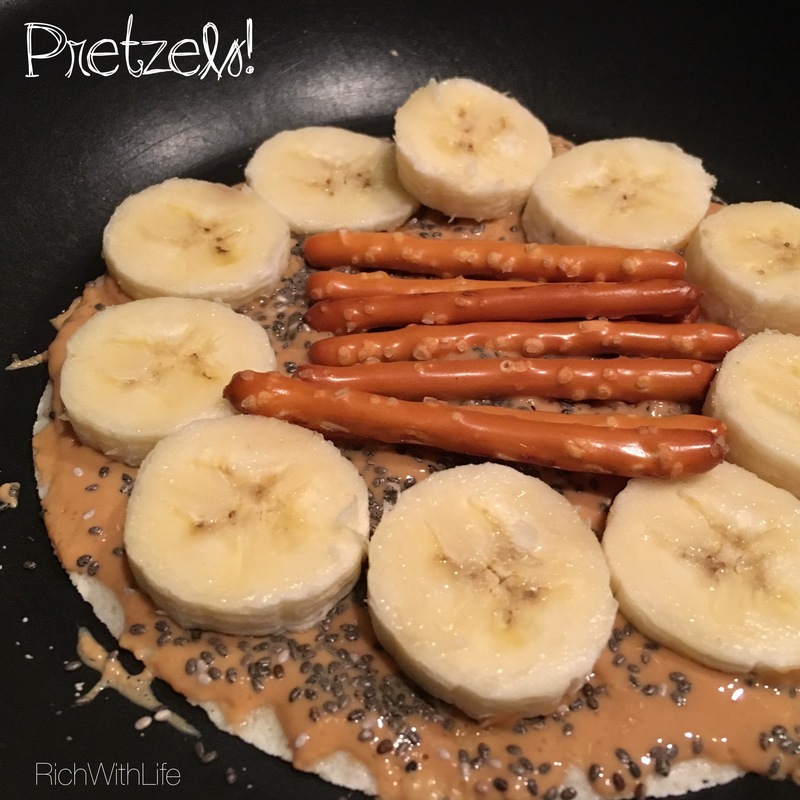 When I first saw this recipe, I was thinking that pretzels would be awesome with it…and it just so happens that you mention that. Also, what brand of corn tortilla do you use? Since going gluten-free, I haven’t found one that isn’t crumbly and bland. Any advice you could give me would be amazing! Thank you for sharing this cute post! Hi! So glad you found the blog! I tend to use mission brand just because I know they’re safe and easily found. But when I lived in Arizona I could find local ones that were safe and they were the best. I’ve seen a few recipes online, so maybe try those. I would just definitely suggest heating them up – either in a hot pan (no oil), the oven on the wire rack, or in the microwave with a wet paper towel. They’re much easier to work with when they’re warmed! Also… pretzels – yesssss!